In recent years there has been a crescendo in the conversation about mental wellness. On January 31 more than 3,000 students were actively engaged in that important conversation as they gathered at the Burton Cummings Theatre to join the True North Youth Foundation’s Project 11 in a celebration of youth empowerment and wellbeing at the inaugural P11 Summit. Project 11 was introduced in 2015 in memory of Manitoba Moose and Winnipeg Jets player Rick Rypien, and is a preventative cross-curricular program centred on giving students positive mental health coping skills to deal with life’s daily stressors. The project also aims to remove negative stigma and the fear of judgement that can accompany mental wellness issues, all the while enhancing students’ academic performance. Now that the grade 5-8 curriculums have been launched across Manitoba, the P11 Summit – which was split into two half-day presentations and hosted by radio DJ Ace Burpee – celebrated the successes of the program and created a forum for wider exposure to some of Project 11’s speakers, role models, and messages. Given the relationship between Project 11 and Winnipeg’s hockey teams, it should come as no surprise that much of the day focused on being a team and supporting one another. Craig Heisinger, Senior Vice President & Director of Hockey Operations/Jets Assistant Manager, is well known for his involvement in Project 11 and his relationship with Rypien. He spoke emotionally to the crowd of students about Rypien’s story and their relationship, all the while stressing the importance of finding the courage to ask for help, and to listen to those who need help. Students showed a lot of excitement throughout the day and for each speaker who brought his/her own inspirational story and messages of encouragement and support. 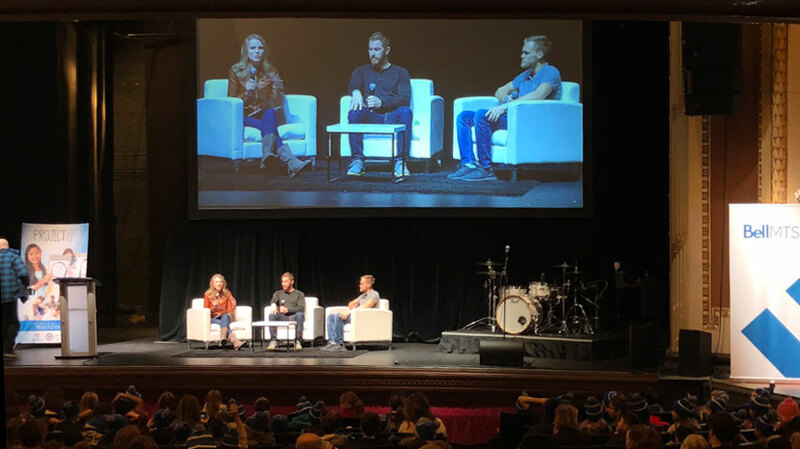 Jets forwards Nikolaj Ehlers and Bryan Little, as well as Moose goalie Eric Comrie, fielded students’ questions on mental wellness in a discussion facilitated by TSN’s Sara Orlesky. Professional sports entertainer and public speaker Cameron Hughes danced his way to the stage with an energetic message about the power of cheer. Olympic Bronze medalist and female role model Desiree Scott touched on the important lesson she’s learned over her soccer career: don’t get down on yourself when things don’t go your way; pick yourself back up to continue trying. Former CFL player Shea Emry brought light to his experience with depression, and how he battled through that with self-care. Musicians Garrett Neiles and Robb Nash, known for addressing mental illness through their music, also performed at the P11 Summit. This school year, more than 500 educators from 200 schools have implemented the Project 11 curriculum. This translates to more than 11,500 students discussing mental wellness more openly, and gaining skills and strategies that will allow them to cope more effectively with challenges and stress throughout their school, personal, and future work life. Teachers wishing to introduce Project 11 in their classrooms can still do so this school year. For more information about Project 11, please visit www.projecteleven.ca.